The weather forecast is less than stellar and everyone has their list of excuses at the ready, but tonight is the night that PAETEC Park makes it's US Soccer debut live on ESPN2. If you live in Rochester and want MLS to come here, then I hope that you are at the game tonight. If you want US Soccer to bring more matches to PAETEC Park in the future, then I hope that you are at the game tonight. 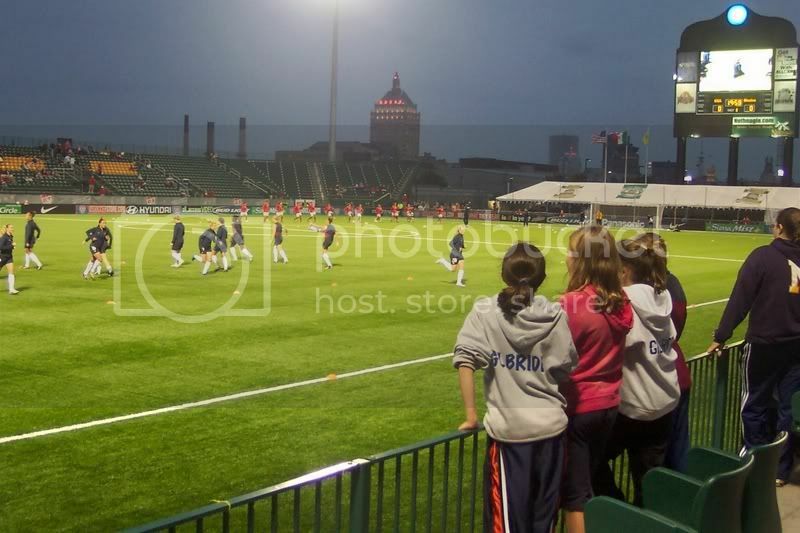 If you want Rochester's soccer community to look good on ESPN2 tonight, then I hope that you are at the game tonight. I know all of the excuses from the weather, to the late start time on a school night, to the price of the tickets, to the laundry list of issues that people bring up with regards to PAETEC Park. To the people that bring up all those issues, I have this to say: I DON'T CARE! This is the US Women's National Team. This is Rochester native Abby Wambach coming home again. And this is PAETEC Park's first impression on a national scale. My question to all of the fans that are looking for reasons not to come tonight is what do you want people to be saying about the soccer fans of Rochester tomorrow? I want them to be talking about how supportive and crazy Rochester soccer fans are. That's why I'll be there tonight. Heather O'Reilly has picked up a slight ankle injury and will be replaced in the US lineup by Megan Rapinoe. Rapinoe is a sophomore at the University of Portland and has scored eight goals for the Pilots this season. Megan has earned her first two caps this year against Ireland and Canada. Briana Scurry suffered a thumb injury during training on Monday. Nicole Barnhart will replace Scurry as Hope Solo's backup tonight. Barnhart has 3 career caps for the US squad. Her first cap actually came as a field player against Mexico during the 2004 "Fan Celebration Tour" when the US ran out of substitutes. Barnhart earned her two caps in goal last year with shutouts over France in the Algarve Cup and versus the Ukraine. A lot of questions were raised about whether the choice of the FieldTurf artificial surface would preclude Rochester from hosting US Soccer games. Obviously that isn't an issue with regards to hosting US Women's National Team games as evidenced by tonight's match. And the players don't seem to be too bothered by the surface at PAETEC Park. When Abby Wambach was asked about the surface after training on Monday, her comment was that it didn't feel like an artificial surface and that it felt like real grass. Tonight's game will be the fifth ever match for the US Women's National Team on an artificial surface. While the US-Mexico rivalry is strong on the men's side, the US women have dominated the series. The US has won every single time to two countries have played. But, the Mexican program is getting stronger and the US very well could end up playing Mexico in qualifying for next year's Women's World Cup. The last time these two teams met was October 23, 2005 at Blackbaud Stadium in Charleston, SC. The US won that match 3-0 thanks to two goals from Abby Wambach and a goal from Kristine Lilly.